The UN Security Council will meet in emergency session to discuss escalating tensions between Israel and Gaza. The UN Security Council will meet in emergency session on Wednesday to discuss escalating tensions between Israel and Gaza, diplomats said, according to AFP. The closed meeting will begin at 9:00 p.m. Eastern time, and will be attended by representatives from the Israeli and the Palestinian Authority missions, the diplomats said. AFP reported that Egypt had urged a Security Council meeting after Israel launched Operation Pillar of Defense in Gaza, carrying out more than 20 air strikes and sea artillery attacks in the Hamas-controlled area and killing the commander of its "military" terror wing, Ahmed Jaabari. Egypt also recalled its ambassador to Israel over the IDF operation. The PA’s envoy to the United Nations, Riyad Mansour, told AFP that nine people had been killed in the air strikes, and added the toll would likely rise. Meanwhile, UN leader Ban Ki-moon called on Israel and Hamas to head off an escalation of hostilities. "The secretary general calls for an immediate de-escalation of tensions," UN spokesman Martin Nesirky was quoted as having told reporters. "Both sides should do everything to avoid further escalation and they must respect their obligations under international humanitarian law to ensure the protection of civilians at all times," he added. Israel's UN ambassador Ron Prosor said that "indiscriminate" rocket fire from Gaza had forced Israel's hand. Gaza "is a strategic threat against the state of Israel, missiles flying in to major cities in Israel," Prosor told reporters, according to AFP. "This is not finished yet," he added. "We have shown restraint but if this continues, Israel will do everything that it takes to defend its own citizens like any other country would do." 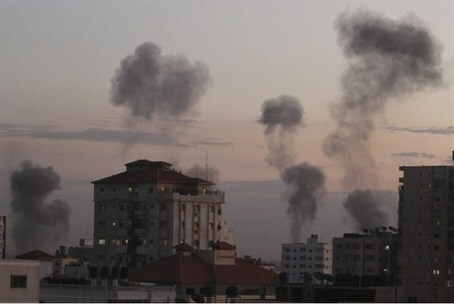 Gaza-based terrorists fired more than 80 rockets at southern Israel’s communities on Wednesday evening. The Iron Dome anti-missile defense system was able to intercept 20 of the rockets that were fired at Israel. In at least two cases, rockets hit populated areas in Ashdod and Be’er Sheva. Damage was caused to a building in Ashdod and a parked vehicle in Be’er Sheva. Gaza terrorists also fired a rocket at Dimona, where Israel's nuclear reactor is located. The rocket fell wide of its mark and caused no casualties or damage. Channel 2 said this was the first time a terror rocket was fired at the sensitive site. Rockets also hit Sderot, Ofakim, and communities in the Gaza Belt. The Home Front Command announced Wednesday that following the security situation in the south and the beginning of the military operation 'Pillar of Defense' in Gaza, there will be no school Thursday for all school districts within 7-40 kilometers of Gaza. In addition, for the safety of the population, a ban was placed on any large gatherings of 100 or more people. A ban was also placed on activities in shopping centers and all non-essential jobs will be closed. Meanwhile, U.S. President Barack Obama spoke to Prime Minister Binyamin Netanyahu and Egyptian President Mohammed Morsi on Wednesday, AFP reported. Obama reiterated with both leaders that Israel had the right to self-defense following the continuous rocket attacks and also called on Netanyahu to try to avoid civilian casualties in reprisal strikes.